In this post, Claudia Paraschiv describes El Carrito’s journey around the Fort Pienc neighborhood in Barcelona. El Carrito is a mobile public participation cart that unfolds to reveal maps, models and drawing materials. Claudia describes different reactions to El Carrito in different parts of the neighborhood. El Carrito in Plaza Fort Pienc. Raons Publiques and I went out with El Carrito – the public participation cart on wheels — on Thursday afternoon and set up in Barcelona’s Plaza Fort Pienc. Due to our ritualistic presence in the space, we began to critically consider the relationship between location and public participation. We often deploy El Carrito in the Plaza Fort Pienc because it is the central social space of the barrio (neighborhood). However, what is the balance between having many people participate that all frequent one type of space versus trying to engage residents from a greater variety of public spaces, even if the net numbers of participants decrease? So far, one of the main problems we have encountered in taking El Carrito to other spaces in Fort Pienc is the lack of participants in many of the other neighborhood public spaces. I should note here that the perception of “enough” participants in a certain space is a relative ruling since some of the spaces in question, such as the Parc de l’Estacio de Nord (North Station Park) have a plenty of users by, say, Los Angeles standards. Students in the Park and El Carrito at Park Entrance. However, stationed at the entrance of the park, a location that serves as a confluence for people coming to the park or passing through from the street or North Station (Bus Hub), we did receive some interested looks, but no one stopped to participate. Perhaps the problem was that the threshold was a place of transition rather than a place for more leisurely strolls. And so we packed up El Carrito and traveled to a pedestrian part of Ribes Street. The street includes a variety of spaces for both moving through and resting in the space, interweaving uses for bicycles, cafés and pedestrians. This location served as the most productive of the day. Ribes Street is for pedestrians, on axis with the Civic Center Plaza and on visual axis with Barcelona’s Arc de Triomf. One of the main populations we hope to engage is growing Chinese immigrant community. While that community’s presence is especially visible through shops and restaurants established in the area, we have yet to get any substantial participation from any new populations in the neighborhood. And so, by the end of our three hour venture on the Thursday afternoon in three different spaces, we obtained less than ten participation documents when the average has been around twenty in the Civic Center Plaza. However, diffusing the option of participation to as many residents as possible may be worth the effort. Another benefit to trying to discover the best locations for engaging the public is discovering new aspects of the neighborhood. The last location with El Carrito on Thursday afternoon was a Punt Verde de Barrio, a neighborhood recycling center that admits anything from appliances to shoes and in turn awards utility discounts. Such city-funded infrastructure begins to hint towards possibilities of integration systems of productive public spaces, instead of isolated municipal elements. El Carrito in Transit and Stationed at Punto Verde. The old fort was constructed in 1719 after the War of the Succession and was demolished in 1868. The description [of Fort] has remained as the name to the neighborhood. Plaque Commemorating the History of Plaza. After seeing this plaque, I was compelled to research some more. 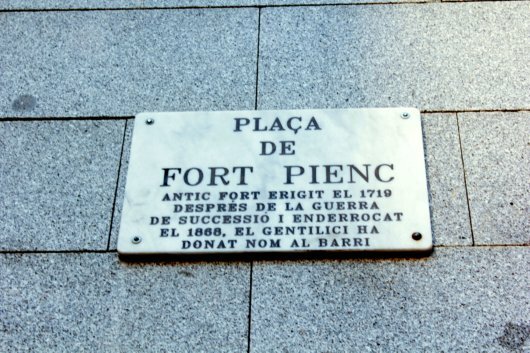 The name of Fort Pienc derives from Fort Pio, a fort constructed in 1716 (or possibly 1719) under King Philip V of Spain in the aftermath of the War of the Spanish Succession (1701–1714). The Fort has its place among other fortification located on the periphery of the old city used strategically during the 1714 battles including Montjuïc Castle atop the hill to the West of the city and the Citadel (now Parc de la Ciutadella) just south of Fort Pienc. In the Civic Center of Fort Pienc another issue brought forth with El Carrito is the importance of participation. 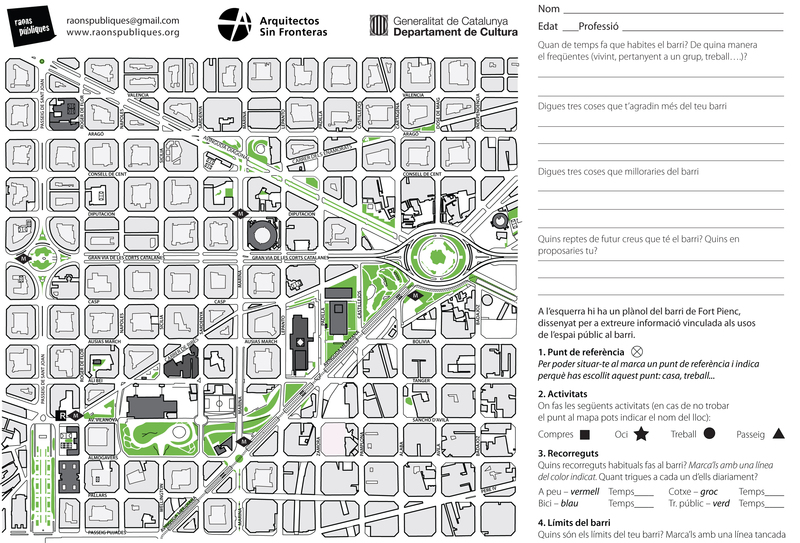 Using postcards created by other local factions of Arquitectos Sin Fronteras, we used these visual aids to discuss other instances of successful participation in Barcelona, or the consequences of a lack of advocacy for communities. Martin and resident discuss participation over a postcard depicting the Monster of Eminent Domain. The postcard shows an image of a mural on a city wall depicting the gentrification that results from tearing down the old for the sake of the new. Currently, the Glories Plaza, an object of design frustration for many decades, shows yet again that the dominant thinking in rehabilitation generally involves creating a blank slate. (Images of the official plan mainly show a wide open space that does not seek integration with the three different neighborhoods at its edges.) Creating buildings and spaces that improve peoples’ daily lives is the reason why participation is essential in city building. Montse at the Market and Lucia with the Seniors. 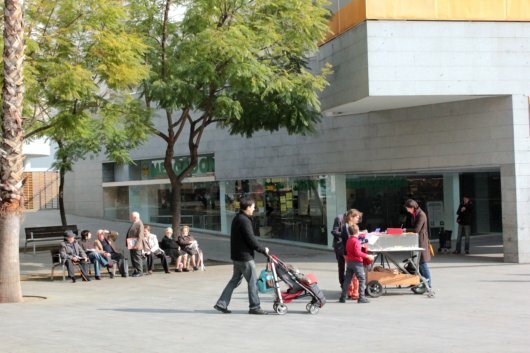 But, as Montse worked to engage the market patrons in the plaza and Lucia spoke to the seniors in their regular location at the first-tier benches, it was evident that people are simply not used to giving opinions about how they imagine their immediate surroundings can change for the better.